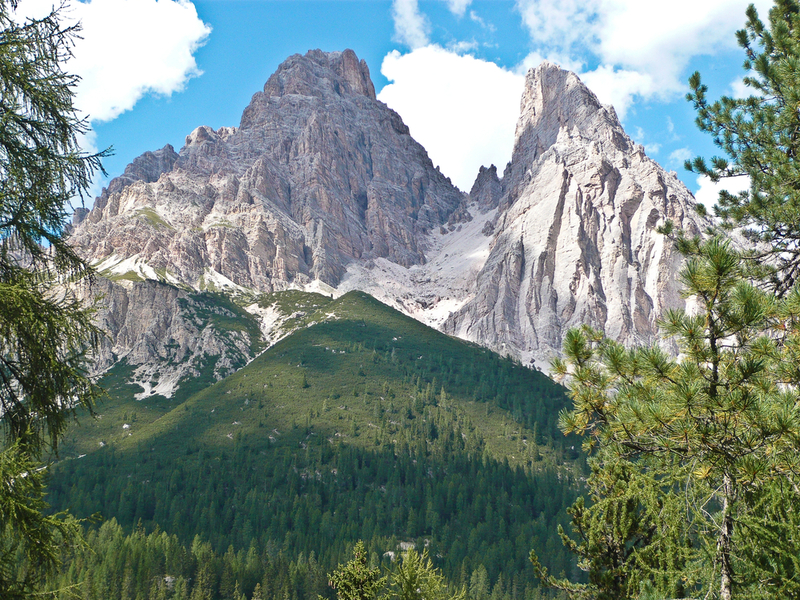 A cable lift system starts from Rio Gere in Cortina d'Ampezzo, first a lift to Rifugio Son Forca at the upper end of Val Padeon. 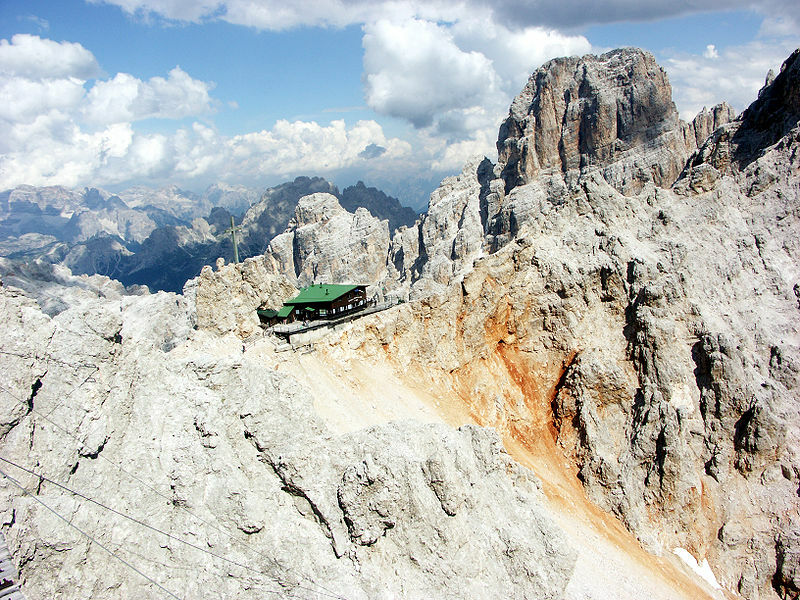 The gondola lift up to Forcella Staunies (2919 m), close to Rifugio G. Lorenzi (2.932 m), was built for the Winter Olympics in Cortina in 1956. Through the eastern part of the massif goes the Dolomite Highway number 3. The two via ferratas VF Ivano Dibona and VF Marino Bianchi both start from the top of the cable car at Forcella Staunies. VF Marino Bianchi can be followed to the peak Cima di Mezzo. VF Ivano Dibona follows the Zurlon-ridge. It is a historical route used in World War I, and later restored and made safe for tourists. At the beginning is the longest via ferrata suspension bridge in the Dolomites, the 27 metre long Ponte Cristallo. 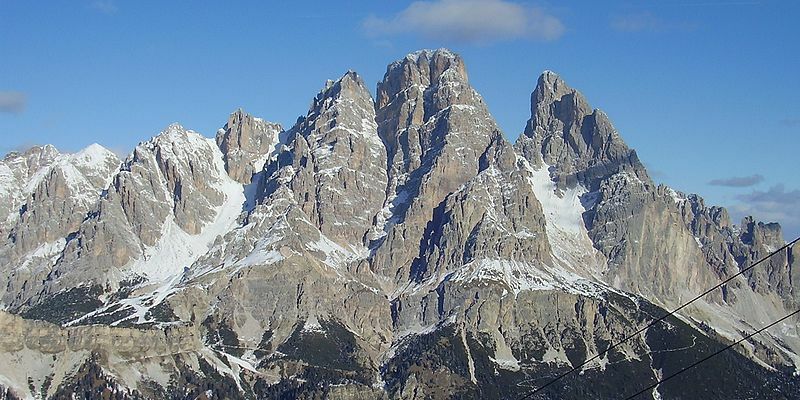 Some of the cabins and restaurants available are the Rifugio Son Forca at 2,235 m; Capanna Guido Lorenzi at 3,003 m (Auronzo di Cadore); Ristorante Rio Gere at 1,680 m; Ristorante Lago Scin at 1,336 m; Ristorante Staulin at 1,370 m; Ristorante Son Zuogo at 1,800 m.
In 1993 the film Cliffhanger was shot on and around the bridge on the Zurlon-ridge, as well as some of the other peaks in the area. A cable lift system starts from Rio Gere in Cortina d'Ampezzo, first a lift to Rifugio Son Forca at the upper end of Val Padeon. From there you can take a gondola lift up to Forcella Staunies (2919 m), close to Rifugio G. Lorenzi (2.932 m).